by Kamala Wilkie, ERYT500, Lead Trainer for SOYA Yoga Teacher Trainings in the Okanagan area. This is often the initial and necessary ingredient in a relationship with Handstand. This inversion requires the heart and commitment of an explorer coupled with a child’s sense of play. -Long held Downward Dogs including a leg lift variation. This is a great place to get familiar with your hand & shoulder alignment & start to build shoulder strength. -Plank (or Plank on your knees) will build shoulder strength while working the same hand and shoulder alignment you’ll need Handstand. Move your mat to a wall so a short edge is next to it. Take all fours while facing the wall. Place your hands a few inches from the wall and outer shoulder width apart. Insure your wrist creases are parallel with the short edge of your mat. Root the mounds of your index fingers and energetically hug your hands and forearms toward each other (without moving them). With an exhale melt your chest toward the floor so your upper arm bones plug more deeply into your shoulder sockets. Keep your shoulders stacked over your wrists, gaze between your wrists and lift your knees off the floor. Step your right foot (or dominant foot) halfway up your mat and keep your right knee bent as your spring leg. Extend your left leg straight back dynamically in the air. Avoid ever bending this knee for energy efficiency. Use your right spring-loaded leg to initiate the kick up action while keeping the left leg poker straight. Practice this kick up action a few times, and then switch legs. This is a great place to work for a while until you gain the momentum that will bring your hips vertically over your shoulders. If your left foot or leg finds the wall above you, bring your right spring leg up to meet it and strongly hug your legs together. From the space between your shoulder blades, press down though your hands while energetically reaching towards the ceiling with your legs and mounds of the big toes. When it’s time, return your feet and knees to the floor and rest back into Child’s Pose. Take your time with the set up and actions and continue to breathe freely throughout. Elation and empowerment are common side effects of this strong yet playful pose. Handstand is an active participation with life, in the same way my 4year old nephew gathered the courage to do something that required him to step up and explore his edges of comfort. This exploration of edges is the place where growth and self knowledge happen. It’s a place full of possibility & mystery and worthy of revisiting on a regular basis. 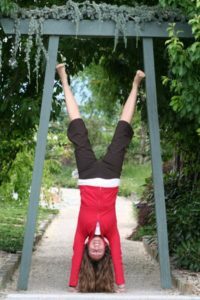 Kamala Nitya is the owner of Purple Lotus Yoga Studio in Penticton BC. 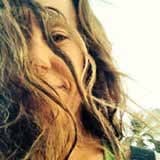 She is a Lead Trainer for the South Okanagan Yoga Academy RYT200 Hour Yoga Teacher Training program with a passion for Anusara Yoga. She will be leading two 200 Hour teacher training programs in the Okanagan this month; a 16 day Immersion and a 4 month extended training. 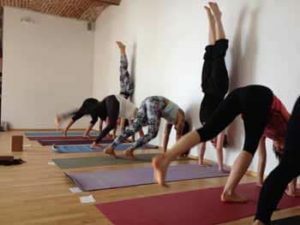 Visit https://soyayoga.com/yoga-teacher-training/ for more information.